The inspiring true stories of the interesting people who inhabit the pages of Sudha Murty's books leave an indelible impression on us. But the books are able to chronicle the stories of only the men and women Mrs Murty has actually come across herself in the course of her social work. There must be so many more wonderful stories that many others have to share. 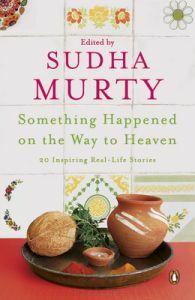 Something Happened on the Way to Heaven is a collection of twenty such memorable true life stories. Handpicked by Sudha Murty from a contest run by Penguin, they capture the hope, faith, kindness and joy that life is full of, even as we make our way through the daily grind. Moving and uplifting, this is an anthology that will engross and delight every reader who believes in the goodness of the human heart. Sudha Murty was born in 1950 in Shiggaon in north Karnataka. She did her MTech in computer science and is now the chairperson of the Infosys Foundation. A prolific writer in English and Kannada, she has written novels, technical books, travelogues, collections of short stories and non-fictional pieces and four books for children. Her books have been translated into all the major Indian languages. Sudha Murty was the recipient of the R.K. Narayan Award for Literature and the Padma Shri in 2006 and the Attimabbe Award from the government of Karnataka for excellence in Kannada literature in 2011.
by Gabriel Garca Mrquez, awarded the Nobel Prize for Literature in 1982, was born in Aracataca, Colombia, in 1928. He studied at the University of Bogot and later worked as a reporter for the Colombian newspaper El Espectador and as a foreign correspondent in Rome, Paris, Barcelona, Caracas and New Yor... View More Gabriel Garca Mrquez, awarded the Nobel Prize for Literature in 1982, was born in Aracataca, Colombia, in 1928. He studied at the University of Bogot and later worked as a reporter for the Colombian newspaper El Espectador and as a foreign correspondent in Rome, Paris, Barcelona, Caracas and New York. He is the author of several novels and collections of stories, including Chronicle of a Death Foretold, Leaf Storm, No One Writes to the Colonel, In Evil Hour, One Hundred Years of Solitude, Innocent Erendira and Other Stories, The Autumn of the Patriach, News of a Kidnapping, The Story of a Shipwrecked Sailor, Love in the Time of Cholera, The General in His Labyrinth, Strange Pilgrims and Of Love and Other Demons. His most recent book is the first volume of his autobiography, Living to Tell the Tale. Many of his books are published by Penguin.